With $2 billion spent annually on stream restoration worldwide, there is a pressing need for guidance in this area, but until now, there was no comprehensive text on the subject. Filling that void, this unique text covers both new and existing information following a stepwise approach on theory, planning, implementation, and evaluation methods for the restoration of stream habitats. 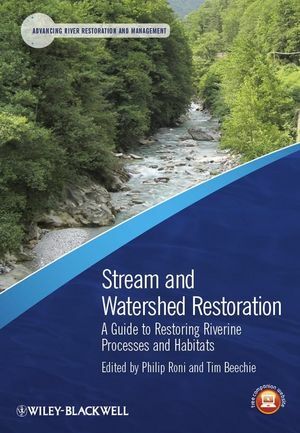 Comprehensively illustrated with case studies from around the world, Stream and Watershed Restoration provides a systematic approach to restoration programs suitable for graduate and upper-level undergraduate courses on stream or watershed restoration or as a reference for restoration practitioners and fisheries scientists. Part of the Advancing River Restoration and Management Series. Additional resources for this book can be found at: www.wiley.com/go/roni/streamrestoration. Dr. Philip Roni has 25 years’ experience working in and conducting research on streams and watersheds in North America and Europe. He has written and edited numerous papers and books as well as regional and international reports on stream and watershed restoration. He currently directs an interdisciplinary research program of more than 20 scientists working on fisheries, watershed and estuarine ecology and restoration at the Northwest Fisheries Science Center in Seattle, Washington. Dr. Tim Beechie has more than 25 years of experience working in management and research of aquatic ecosystems, focusing on understanding how watershed and riverine processes influence channel morphology and river ecosystem dynamics. His recent publications focus on diagnosis of restoration through watershed analysis and development of process-based strategies for river restoration. He currently directs a team of scientists researching the influences of watershed processes and land uses on riverine ecosystems.